Dallas Personal Trainer - An awesome exercise that increases core stability to a massive degree and serves as a very important bridge between low level ab exercises and very high level, intense ab exercises that few people other than gymnasts and very fit personal trainers can perform. Using one leg on this exercise makes it possible to learn to lift the legs using the strength of the abs to prepare oneself for eventually lifting both legs at the same time with the abs. 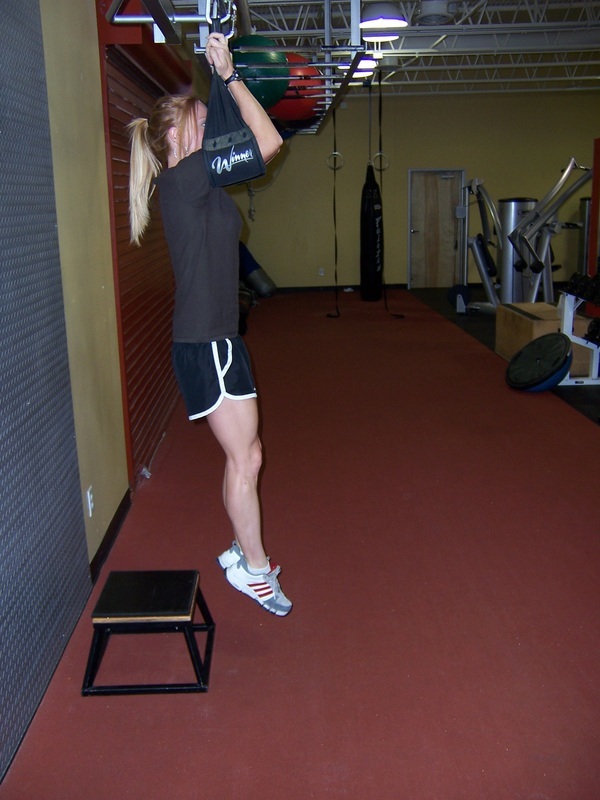 Hang from a chin-up bar, hanging straps (as pictured), or a knee raise bench and let your legs hang straight down below you. Lift one leg out to the front as high as possible by contracting your abs tightly without kicking, swinging, or using momentum at all. Once you have lifted it as high as possible, smoothly lower it back to the starting position and lift the other leg in the same manner. Alternate back and forth until you have completed the specified number of reps with each leg (count 1-1, 2-2, etc. ).